There’s nothing better than a nice, crisp salad to accompany your dinner. If you’ve been on Pinterest at all, you know that the possibilities are endless. 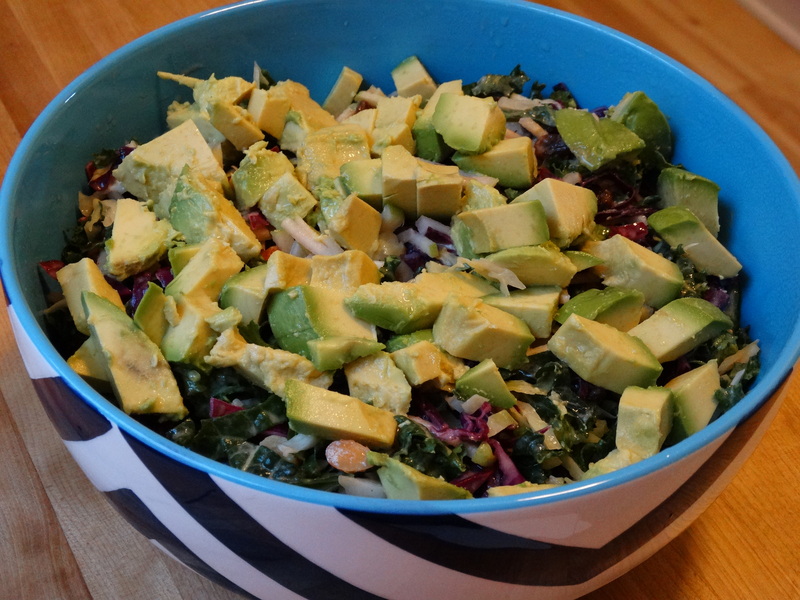 For the past couple of years, kale salad recipes have really been catching my eye. 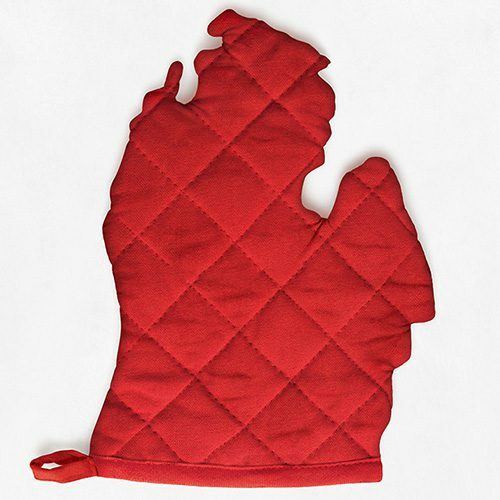 Once winter rolls back around (wait…didn’t it just end?!? 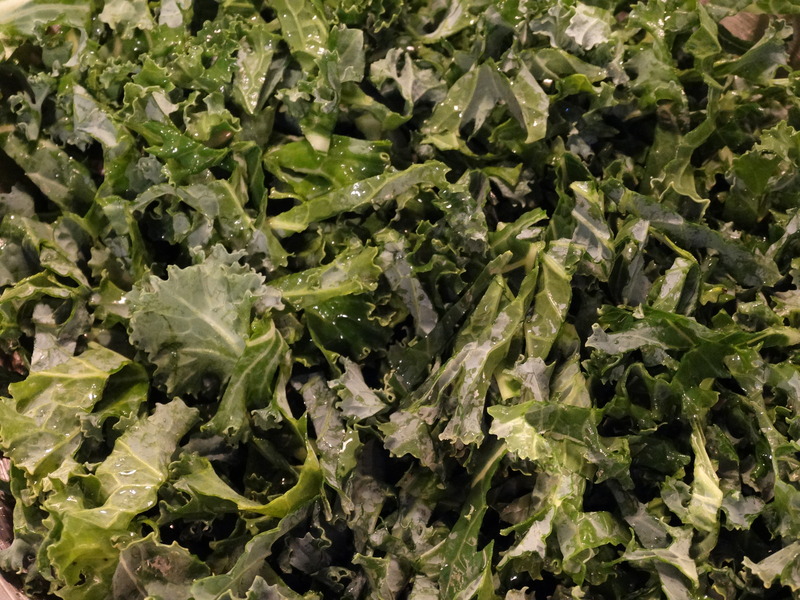 ), I’ll be sure to share my favorite winter kale salad. But since spring is trying to break through the chilly temperatures in Chicago, I figured this salad would be the perfect side to bring for dinner at a friends house this past weekend. I adapted this recipe from one I found on Pinterest via the blog, Use Real Butter. I think it was the julienned Granny Smith apple that made me want to whip this recipe up as soon as possible. Since my side dish needed to be gluten and lactose-free, this fit the bill perfectly! Begin by washing your kale and cabbage leaves before you cut them. I use a great produce wash that we get from Trader Joe’s to help get the dirt and pesticides off. 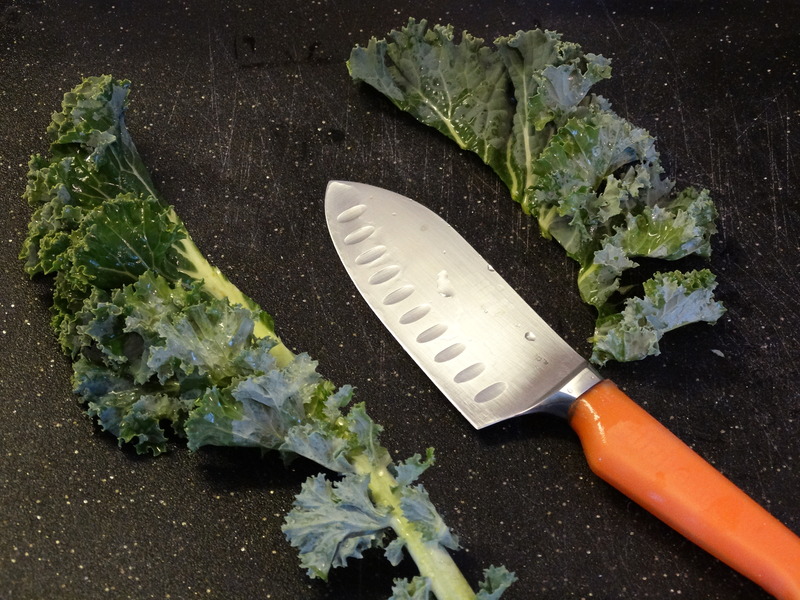 Once your greens are washed, cut the leafy part of your kale off the stems. After removing the stems, slice the leaves into thin pieces so that they appear shredded. You will need a total of 4 cups shredded kale. I put the kale into my largest bowl to allow for easy tossing later. 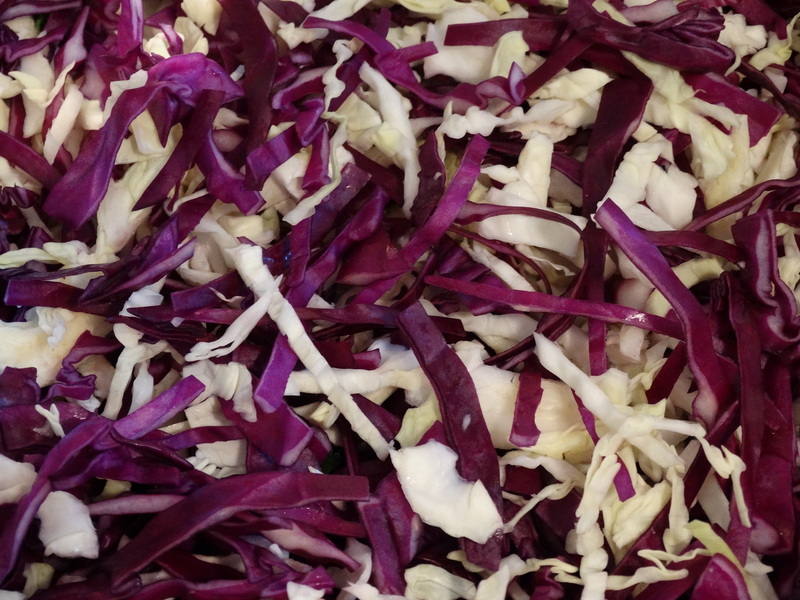 Next, shred your red and green cabbage. You will need 2 cups of each. Add it your kale. Then add 1 cup raisins and 1 cup almonds. I chopped my almonds in half so that the pieces weren’t too large. You could also use slivered almonds. 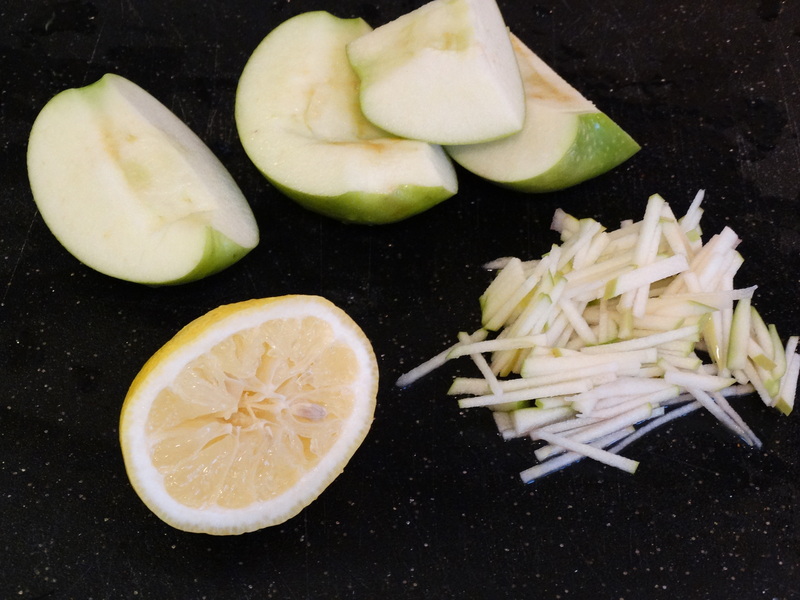 Cut one Granny Smith apple into quarters and remove the core. The original recipe called for a whole apple, but I found that half was enough. You may prefer more or less. Cut each quarter into thin slices and then cut those into thin strips, so that they are julienned. My apple started to brown almost immediately, so I quickly cut a lemon in half and dowsed it all in lemon juice to stop the oxidation process. Don’t worry – the dressing calls for lemon juice. Once your apple is sliced, into the salad bowl it goes! 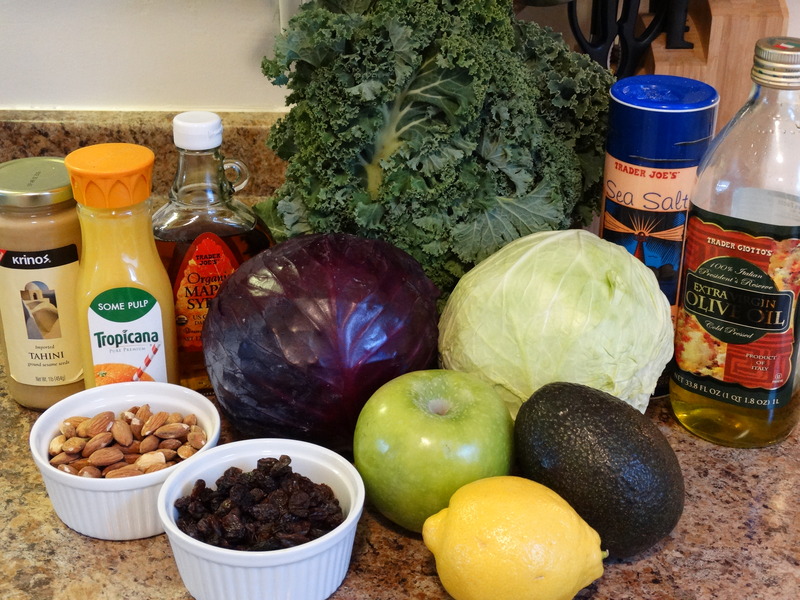 The suggested dressing for this salad is a Maple Orange Tahini Dressing. 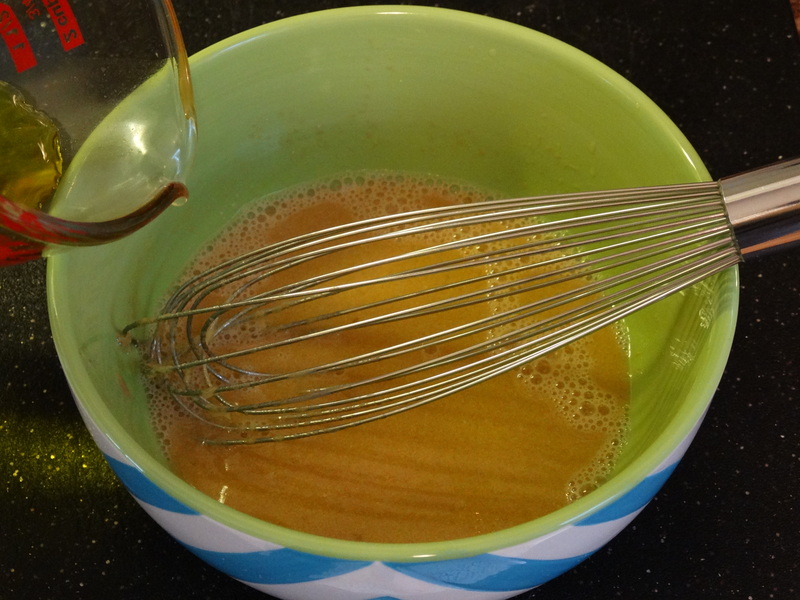 In a small mixing bowl combine 1/2 cup orange juice, 1 tablespoon maple syrup, and 3 tablespoons tahini. (Not familiar with tahini? It’s a paste made from ground, hulled sesame seeds.) Whisk to blend. Slowly pour in 1/3 cup olive oil while whisking constantly. Once blended evenly, add lemon juice, salt, and pepper to taste. Pour the dressing over the salad and toss. I used long tongs to get the job done. When your salad is evenly coated with dressing, transfer to your serving bowl. One final step – peel, pit, and dice your avocado. I waited until the very end to add it to my salad to prevent it from becoming a pasty mess during the tossing process. (The avocado I used was nice and ripe.) Once the avocado is in the bowl, top the finished salad with a bit more lemon juice to help keep the avocado nice and green. 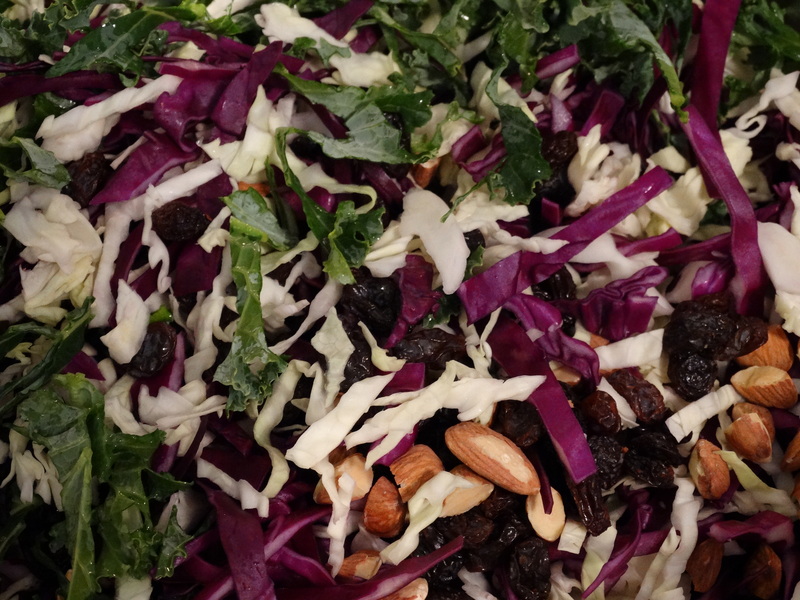 This salad is a perfect combination of crunchy, tangy and sweet. I hope you enjoy it as much as we all did! 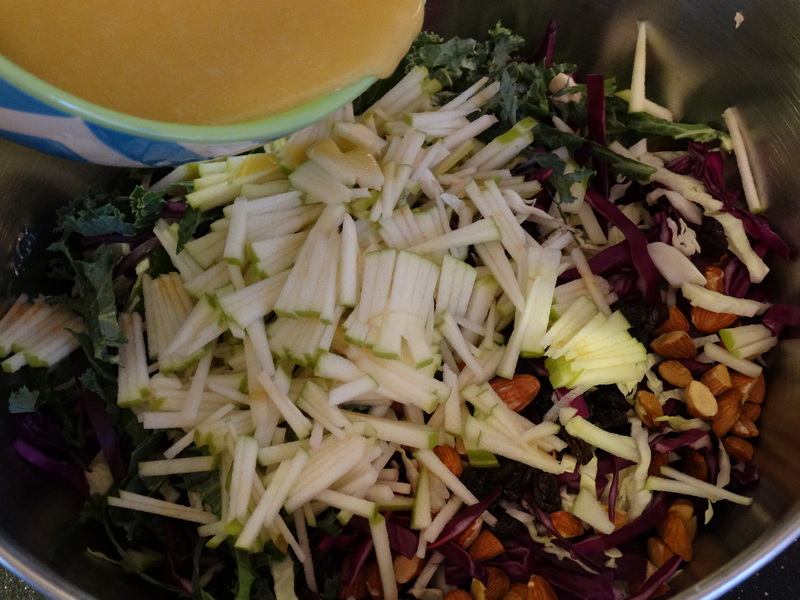 1) In a large bowl, combine the kale, red and green cabbage, apple, almonds, and raisins. 2) To make the dressing, add orange juice, maple syrup, and tahini to a medium mixing bowl. Whisk together. Slowly add in the olive oil while constantly whisking. Add lemon juice, salt and pepper to taste. 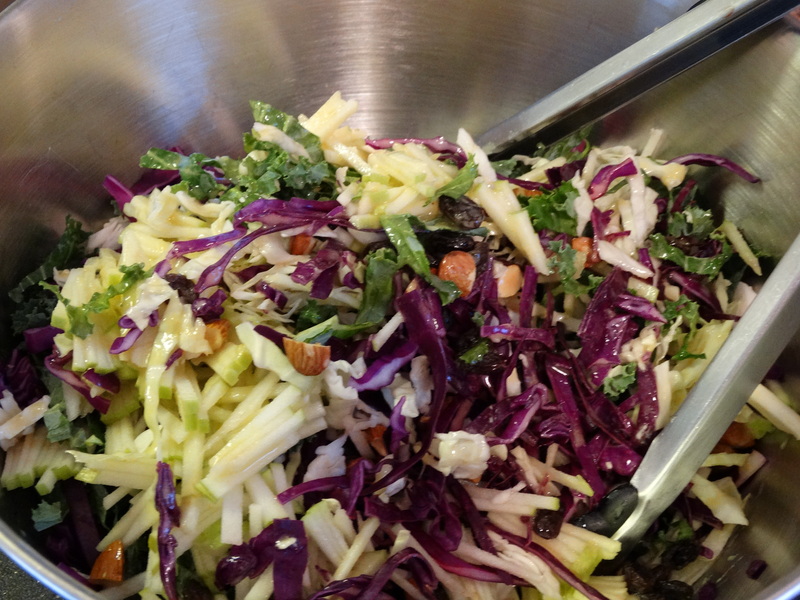 3) Pour dressing over the salad, toss until well coated. 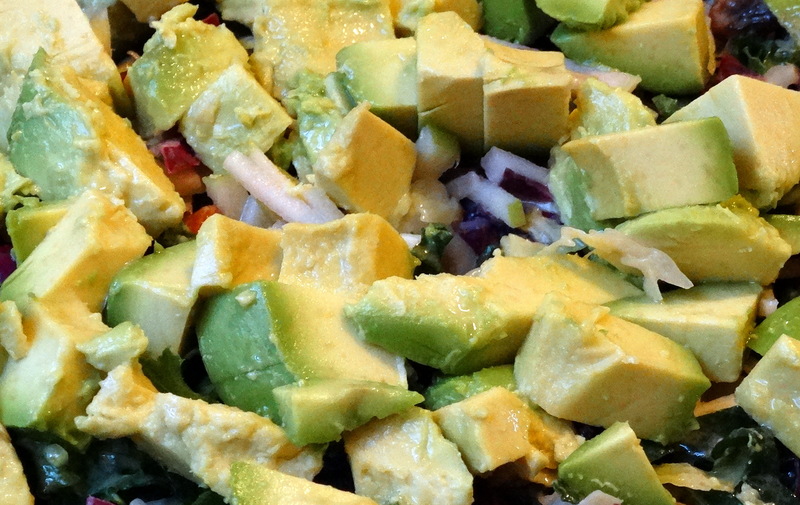 4) Add diced avocado, spritzing with a bit of lemon juice to prevent browning. This looks like the perfect side for our Fourth of July cookout!! 😉 Awesome blog, Marta! That looks wonderful! Kale salads are awesome – I just had one the other day with strawberries and a poppyseed vinaigrette. I want to eat the picture! Yummy! !